My clients will assume I don’t trust them if I give them a contract. I hear this all the time, which is why I’m grateful that Laura C George shared her story about how she learned this to be a myth. 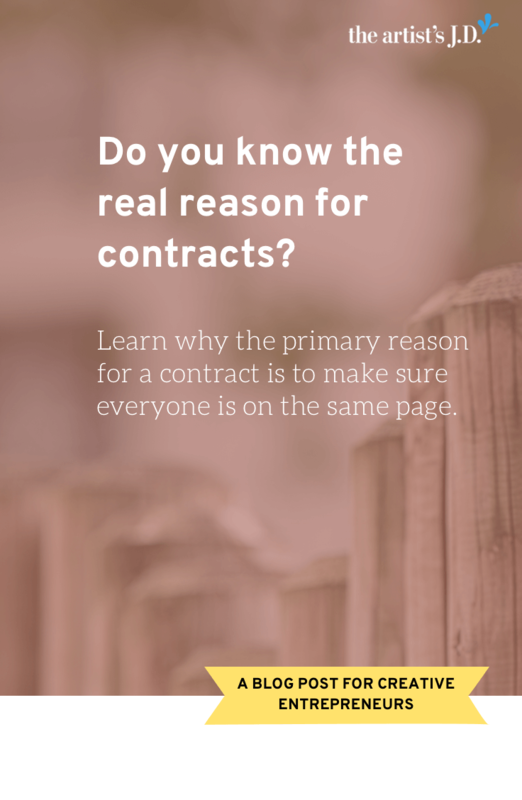 I bet you assume that the primary reason for a contract is to prevent someone from taking advantage of you. But I’m going to let you in on a little secret. 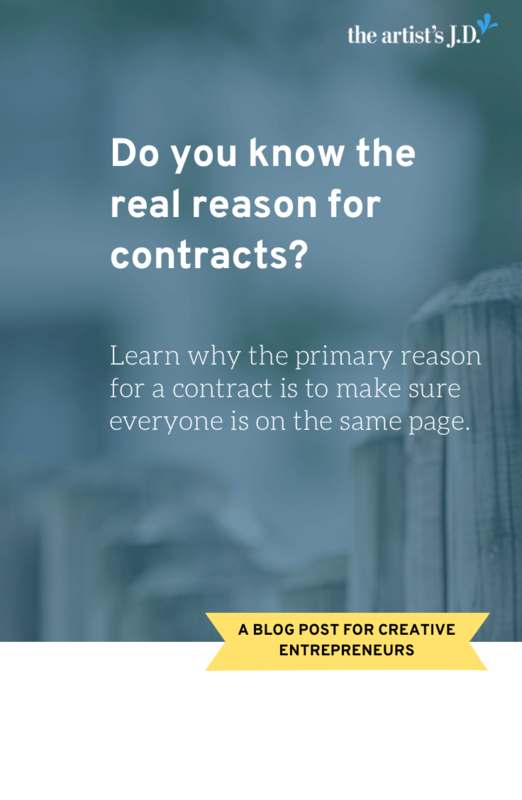 Contracts exist for an entirely different reason and this reason is one that most lawyers won’t tell you. 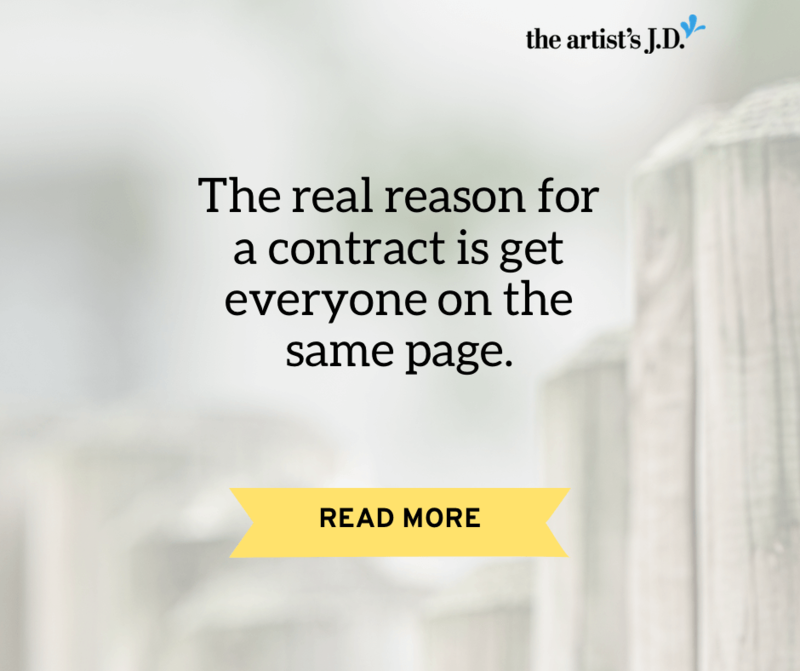 The primary reason for a contract is to make sure everyone is on the same page. 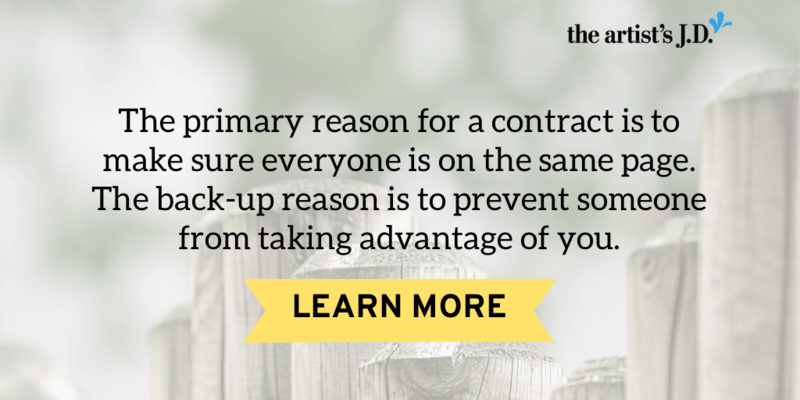 The back-up reason that we have a contract is to prevent someone from taking advantage of you. 99% of people when they enter into a contract intend to hold up their end of the bargain. What can make some of that 99% not hold up their end of the bargain is the fact that the two of you have different understandings about what deal you agreed to. And if you both aren’t on the same page, then someone is going to unintentionally not live up to the other person’s expectations. 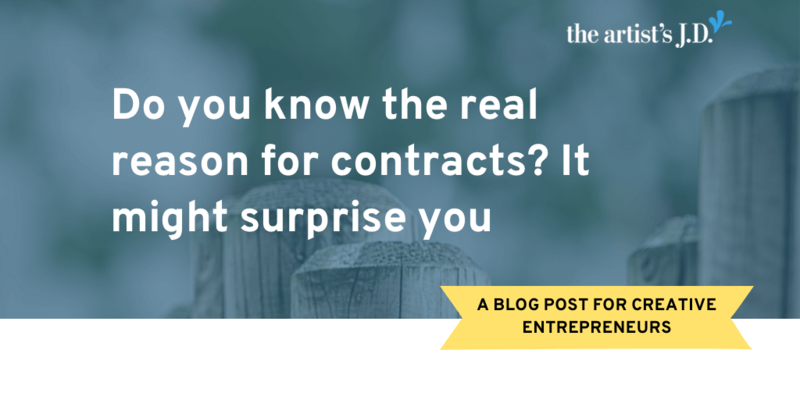 Contracts help you create boundaries and set expectations. And in my opinion, contracts actually make you the kindest business person around. So what goes in this contract? 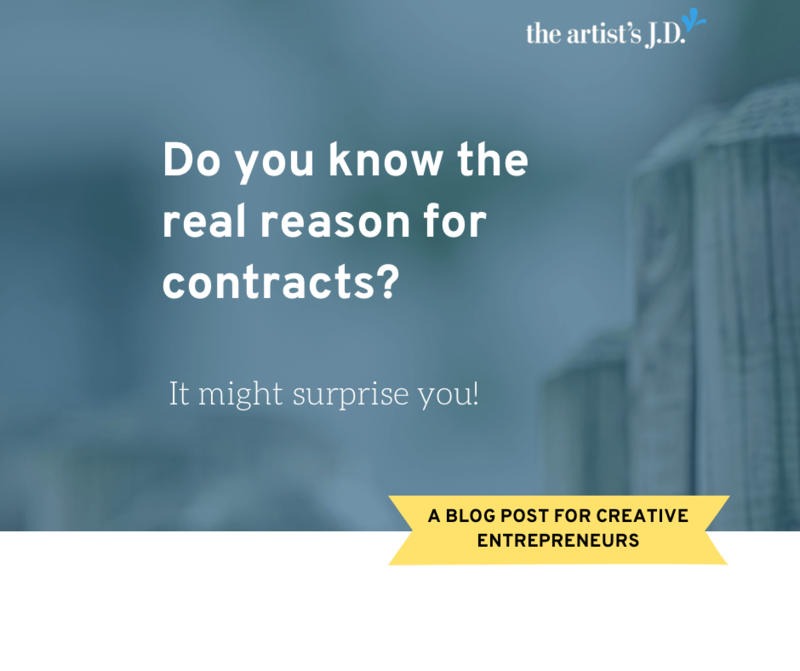 Many creatives assume that in order to be valid your contract has to be full of legalese and on fancy paper. And I’m sure many lawyers are grateful for that misunderstanding. But most people aren’t signing a contract just to screw you over. Most people go into a contract intending to uphold their end of the deal. Which means that a contract is primarily for the two of you. So that you and the person you are working with have something to look back on when confusion, misunderstandings, or hurt feelings arise. Or in other words, no one else will read that contract unless you both get pissed off and can’t work things out. So 99% of the time what’s written on that piece of paper is only to serve as a reference for the two of you. But when you write the contract, there’s no need for you to stick a bunch of legal jargon in there. Because the goal of your contract is to prevent misunderstandings. Meaning if you stick of bunch of legal jargon in that you don’t understand, you’ve just introduced lots of room for misunderstanding. 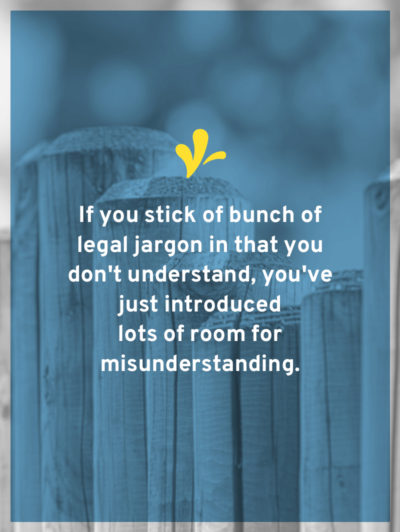 If you stick of bunch of legal jargon in that you don’t understand, you’ve just introduced lots of room for misunderstanding. I want you to keep this goal in mind as you write your contract. And measure what you write against this goal. 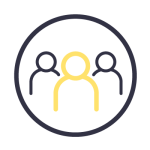 Your contract could include lots of topics. But at minimum it should address the two biggest sources of misunderstanding: scope and money. 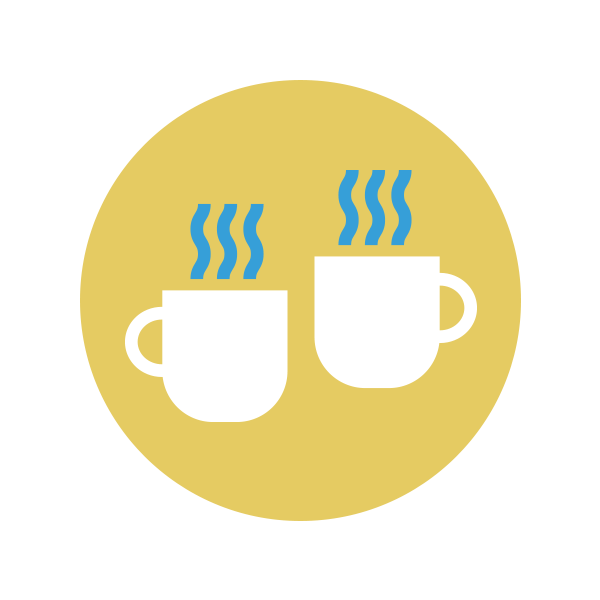 Illustrator will provide a graphic for Kiffanie’s use on her website and marketing materials. The graphic will be a stylized illustration of Kiffanie for use in both print and web. 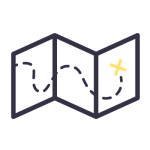 All initial sketches, iterations and final finals will be available to Kiffanie via a shared Dropbox folder that Illustrator will provide access to. Once finalized Illustrator will provide Kiffanie with both a print-ready and a web-safe version. Kiffanie will download these files from the Dropbox no later than October 24, 2016. Now are there things I could include in this contract? But once you create a template contract, you aren’t done. 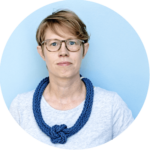 Contracts need to be a living document. Our contracts shouldn’t be drafted and then used robotically. They should be updated, changed, and modified to stay current with your business and the things that you learn. This book is full of the things I hope to never repeat, the stupid mistakes I’ve made, and the lessons I’ve learned. I credit much of the progress I made my first year in business to this book. Because the act of reflecting, writing, and sketching these lessons ingrained them into me. There were times that I started to do something and the image of those pages popped into my mind. That image gave me just enough pause to stop and correct course. Not only has this book helped me be a better lawyer and business person, but the items in this book have helped me modify my client contract. When misunderstandings arose, I took the time to figure out what caused the misunderstanding and changed my client contract. 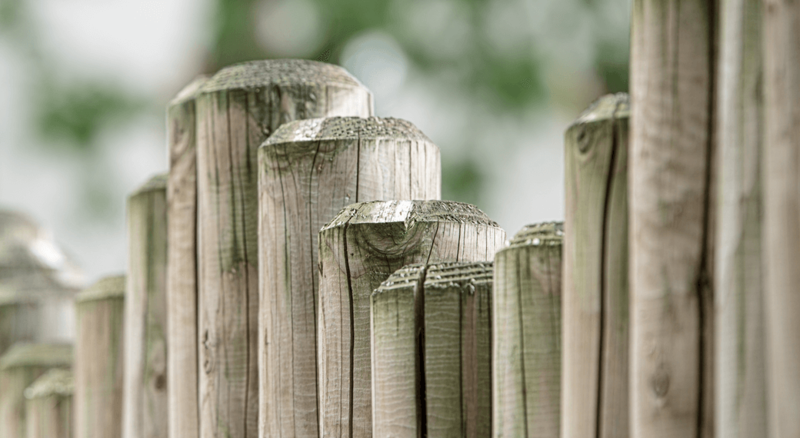 (Sometimes this process was repeated multiple times for the same section.) When all hell broke loose, I reflected on what started the problem and what I could add to my contract to prevent it from happening again. That’s why this book has been so powerful for me. It’s been the blueprint and guide for how I need to modify my client contract. It’s shown me patterns and has allowed me to change and edit my contract to prevent those from occurring. It’s taught me to explain certain sections of the contract that the State Bar requires me to include. It’s taught me to change the format. Even if you don’t keep a book like this, you should be checking your contract against projects that left you feeling used and unappreciated. Did this happen because you failed to enforce part of your contract? Or is this something that your contract didn’t cover? Would clarifying solve the problem? 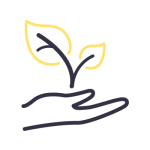 Thinking about your client contract as a living, breathing document that changes and grows as you do will make sure that you won’t have to repeat the same mistakes again. Or have the same conversation a million times because that section always leads to a misunderstanding. 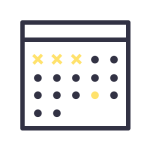 So once you get your template and start handing it over to clients, make sure you also tweak it over time. And incorporate those lessons that you don’t want to repeat. 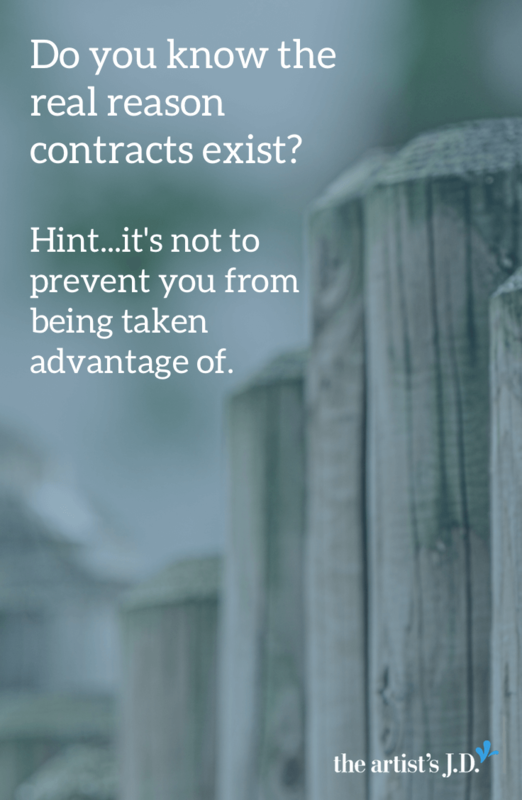 Does this give you a little more confidence about handing a contract over to your clients? Why or why not?